I bought the 16Gb Wifi-only version. I really ummed and aaahed about paying the extra for the 3G version, but in the end the £ only stretched so far. 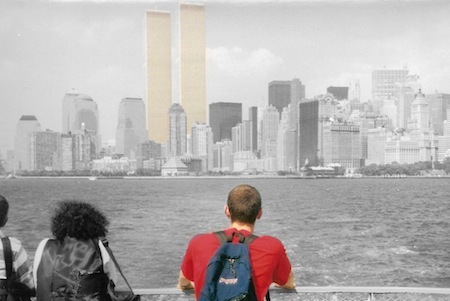 I regretted it all the time I was in the US. Having to find others’ spotty wifi to borrow when you’re travelling round was a pain. There were so many times, not least driving, when it would have been useful to be able to pull Google Maps up. As it was, I used ALK’s CoPilot Live on my iPhone 3G to get around (it was super-slow on the 3G by the way. Just about usable most of the time). But aside from using it as an oversized phone, it fared very well as a computer that you could all use, pass around, and generally use as a shared device to explore things together. The kids were entertained with The Wiggles playing through the Videos app, as well as a selection of games such as 123 Color HD, 5-in-1 Kids Pack and Doodle Buddy. They seem to pick up the interface much faster than many adults, who often approach the iPad with a certain amount of tentativeness, as if it will break. Kids have no such worries! When they went off to sleep, I settled down to some reading. It’s a great device for this. Sure, it’s a little heavy. But I find myself reading in bite-sized chunks these days, so the weight hasn’t been an issue. I haven’t moved on to eBooks yet – I still like the feel of a paperback. But for long-form essays such as those I save to my Instapaper account, it’s ideal. And comics on the device are superb. Really. I’ve reviewed Comixology’s Comics app before for the iPhone, but now it’s on the iPad – wow. I spent almost the whole rest of the flight back from the US reading through new comics. Although I have hundreds of back progs of 2000AD in my loft, I feel that comics are a more disposible form of entertainment (unless they’re collected into decent graphic novels). Comics fit the iPad so perfectly, I’d be happy to move over to downloads entirely for my 2000AD consumption, if only they’d offer a decent system! I read Wanted by Mark Millar, one of the best series I’ve read in a long time. And it was immersive. As John Gruber has said, the iPad becomes whatever you’re doing. And I was reading, as simple as that.. But now I’m at home, and I have access to my MacBook. But I’m still using my iPad an awful lot. It has become my writing device of choice, especially in conjunction with a Bluetooth keyboard. I play a little music in the background, and get cracking. 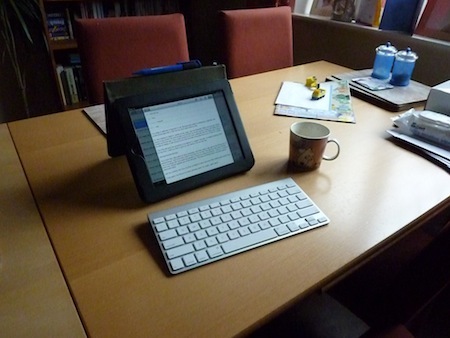 I feel very focussed and distraction-free using the iPad – uni-tasking works well for me. I’ve installed Documents To Go on my iPad and iPhone, and I keep all my files on Dropbox. Syncing files through iTunes is a bit of a mess, but with online sync, I have round-trip editing on my iPad, iPhone, Mac, and any computer. It’s also a great music device. I have the iPod app, Laurent Garnier, Soma FM, Tuner (playing Absolute 80s), and in this mode the iPad mostly resides in the kitchen. The speakers are not going to blow you away, but are good enough to hear while you’re doing some cooking and chatting. In “kitchen mode”, the calendar becomes useful for everyone, and Weather Pro HD keeps an eye on the skies for us. As I mentioned, I bought the Wifi-only version, but 3 kindly lent me one of their Mifi units to try out some 3G connectivity. Their network isn’t great round here (mind you, no-one’s is! ), but when I did get coverage, it was excellent. A few days later I was zooming down the M4 at 1.5Mbps download, 1.7Mbps upload (UPLOAD!). Superb. The little unit is a great complement to the iPad, but as Frasier Speirs has already pointed out, the failing comes when you don’t have coverage, but your iPad still thinks (because of the good wifi connection) that you have excellent coverage. If the iPad had a spinning beach ball, it’d be whizzing round. However, I also found that, when using the Mifi and Google Maps, the location was surprisingly accurate, and updated quite quickly. Yes, there was the occasional glitch, but it was much better than I expected. You also have the bonus that you’re not restricted to 20Mb downloads from iTunes and the App Store, because the iPad thinks you’re on Wifi, not 3G. The only other negative that I found with the Mifi was that you had to press a load of buttons to switch it on, then enable Wifi, then connect to 3’s network… But, I was given the old version of the MiFi, whereas MiFi 2 (out now), is a one-button connect. Well done 3. I think it’s a good addition to your iPad if you’re going to be out and about with it occasionally, but haven’t plumped for the iPad 3G. I find some things on the iPad much easier than on the desktop. ColorSplash is a good example. I’ve altered some photos, and produced some pretty good results. The photo below would have taken me an age on the desktop using Photoshop, and just as importantly, it would have been a chore. But using ColorSplash and painting the colour back in with my finger, it was fun. None of my electronic goods go naked; with children, it’s an absoloute necessity! Proporta were kind enough to send me a couple of cases and a screen protector. 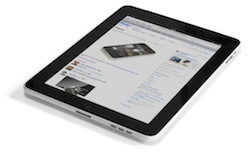 I tried the Mizu shell – which is both soft and hard, and made the iPad very grippy. 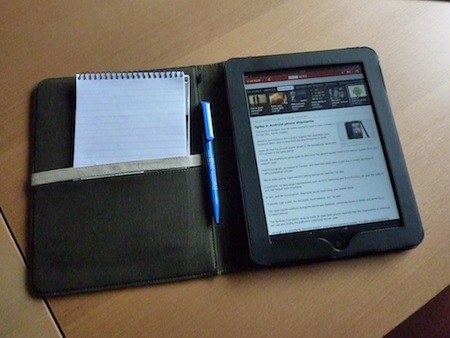 I’m currently using their beautiful Recycled Leather case, which makes my iPad seem complete. It adds a bit of bulk to the iPad, but it feels like it conforms to the book-like nature of the device – the iPad is just something I want to pick up and flick through. Full reviews of these cases will be along in a little bit. It’s a wonderful device, but it’s not all gravy of course. I am concerned about having my email available for all to see. Maybe multiple users should be allowed, or at least add the ability to password protect apps, especially ones with personal infformation such as Mail. Most of this post was written on the iPad, and then uploaded to my blog via the WordPress iPad app. Which is pretty good, but the app doesn’t quite cut it just yet. So the finessing has to be done via my Mac. The ability to jailbreak is important to me. Backgrounder adds in multitasking. LockDown can protect those apps with a PIN that you don’t want others to see. I’m also waiting for Apple to update its own apps, such as MobileMe Gallery and Remote. Whole-house music control will work wonders on the iPad, but at the moment it feels a bit kludgy with a scaled-up iPhone app. I find myself wanting to do more, especially with the Photos app. I want to be able to delete or edit photos on the iPad and have those edits show up in iPhoto on my Mac. The iPad still feels like something of an adjunct to a bigger computer. I’m eagerly awaiting iOS4 for the iPad. I want my iPad to grow up, and stand on its own two feet. You’d think that, after years of using computers, and three years to get used to the iPhone way of dealing things, that I’d be fairly used to all of this by now. But I find that the iPad really enables me to do things with more ease and pleasure. There’s no sense of slowness. There’s no cause to think that I should upgrade any of the hardware. That level of thinking about computers seems abstracted away. Call me a fanboy, but I love my iPad, so expect to see a few more iPad-related posts around here. Thanks for the review, you echoed many of the sentiments I’ve had myself. Apple got something very right with this product. It seems to me that much of the criticism thus far has come from those who don’t own it and haven’t used it. It’s an incredibly tactile machine & not just in the obvious sense. I’ve found it’s portability from room to room, chair to floor, sofa to bed etc very liberating. It’s a wonderfully designed device. Honestly, I haven’t had cause to find much lacking in it all. Granted I don’t expect it do everything, but so far it’s served a purpose for anything I wanted to use it for. I’m really looking forward to seeing the form & function evolve. Me too. I bought this device in the full knowledge that it’s a first generation product, and that the things that will make it even more exceptional are coming. When I can use Facetime from my iPhone to an iPad it’ll be amazing. Bought mine on Friday. Also, went for the 16Gb WiFi only version. Would echo your’s & John sentiments: it is liberating & a great reading device. I’m actually getting around to reading some of the hundreds of webpages I’ve been bookmarking over the last few months now. I love the way Marvel comics app pans from panel to panel…& they look great too (will have to give comixology’s app a try). Yes, it’s an extravagence but it sure is a lovely thing to use. Jason, I recommend trying Instapaper. You install a small bookmarklet into your desktop browser’s toolbar, then sync that across to Safari on your iPad. Anytime you come across a web page you want to read later, just tap on the “Read Later” bookmarklet, and it’ll be saved to Instapaper, but stripped of all the ads and other gubbins. It’s a great way to store articles and stuff for later reading. hmm, very nice review, and seems you really have good days with ur iPad. well, I also really love my iPad. It has almost completely replaced my personal computer. For the things I do… Is is perfect! Much nicer than any CPU I have ever owned. All my other computers would do a lot of things I would never use it for, and do it painfully in the process (slow, buggy, etc.). When you get down to what you do most on you personal computer… the iPad does almost all of the things an average user needs, and with a much much nicer U/I. Easy of use, fast, and efficient. The other computer manufacturers could learn a thing or two from this, but even if they do… they will probably screw-up the one they come out with by adding all the crap back in again. Ugggggg!!!! just seen your recommendation to try Instapaper having literally only yesterday started using ‘Read It Later’ (which I saw on my RSS reader MobileRSS – I liked it on the iPhone & it’s much, much better on the iPad). Great article, I have an ipad ind I totally agree with what you saying.